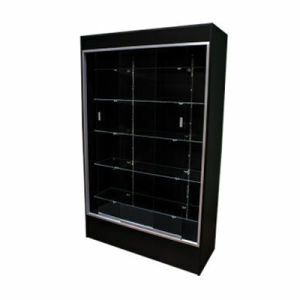 Dimensions: 48" x 18" x 78"
Dimensions: 38" x 18" x 18"
Display Case, Black, 72" x 18" x 38"
Display Case, Maple, 72" x 18" x 38"
Showcase your merchadise in an organized and attractive way with these display case units from American Retail Supply. Our Glass Front Wall Unit Displays give you a clear and crisp view of all your valuable items, but also maintain a sense of security with the 1/4" sliding glass doors. Designed from low-pressure laminate. Available in black and maple. 48L x 18D x 78H.